With battery life that goes on and on, the Asus C300M is a lightweight laptop for people on the move. You'll need to be a big fan of bright colours though. Who'd have thought it? The Chromebook is all grown-up. Early reviews of these cloud-connected lightweight laptops were a little sniffy, but the Samsung Series 3 in late 2012 silenced much of that criticism. Now a new wave of bigger, better and bolder devices are coming through – still inexpensive, still portable, but with much more power. 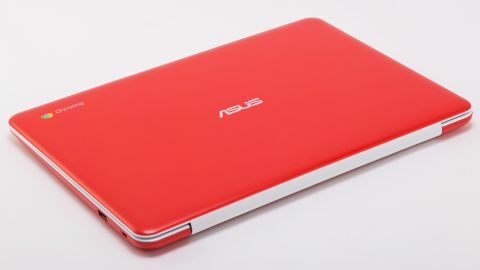 The Asus C300M is such a device. With its dual-core Intel N2380 CPU, it has low-end specs for a laptop but more processing power than most other Chromebooks. With a slim profile boasting a height of 20.3mm from lid to base, the fanless C300M has Ultrabook styling and Chromebook mobility. At 339mm wide and 230mm deep, the 13.3-inch screen is part of a trend towards larger displays. The first wave of 11.6-inch Chromebooks, like the now classic Samsung Series 3, are beginning to look like toys in comparison. Chromebooks are usually a bit plasticky – and that's fine when you're paying £200 (around $250 in the US, in the case of this model) or thereabouts for a computer you can chuck in a rucksack. The Asus C300M just about falls into that ballpark, with a lid barely 5mm thick and a casing that's distinctly springy in places. The build is solid though, and it looks reassuringly like a standard notebook until you pick it up. The rounded corners, common to Chromebooks, add a bit of softness to the overall design. If we were to guess the brand decisions behind it, we'd go with the student market. It's a funky rather than functional looking wrapper for a piece of kit that's good for web research, media consumption and essay writing. What you lose in brawn you gain in portability – it weighs just 1.4kg (3.08lb). That just about enables you to carry it around open, cup of tea in one hand and Chromebook in the other. Until recently it was en vogue to disguise the construction of Chromebooks with a grey or black finish, as though pretending to be metal or carbon would somehow atone for the reliance on synthetic polymers. Not the C300M. It's loud and proud, with off-primary finishes that include blue, yellow, red and, um, black. We road-tested the red edition which, truth be told, is a bit closer to blood orange. It's at this point that we would be making a joke like "it's too orangey for Chrome" if we hadn't enjoyed using the C300M. But we did enjoy using it – very much. The candy coated colouring added something to that. As far as ports go, the C300M is better than some Chromebooks, but worse than others, with an HDMI, USB 3.0 and SD Card port down the right-hand side. There's also a dual function audio port. The USB 3.0 port isn't colour-coded, so some customers might miss it unless they read the specs. You'll find a single USB 2.0 port over on the left side. That's, essentially, a sufficient number of USB slots for a mouse and an external drive and not much more. But this is a Chromebook, designed for portability and webby stuff – it's not really intended as a full desktop replacement. Unlike Toshiba's higher end Chromebook 2, another 13.3-inch contender, the C300M's display doesn't go up to 1080p. If HD video's what you're after, you'll need to put up with 720p, you poor thing. The specs tell us that the C300M's native resolution is 1366 x 768 and it looks crisp and clear at that – allowing for the relatively shallow viewing angle. Dive into the display settings and you can nudge it up another notch to 1536 x 768 but, take heed, no good will come of that unless you like your text unreadably fuzzy. With a recommended UK retail price of £219 ($249 in the US), we've seen the Asus C300M going for as little as £189.99 in the UK. The Chromebook market is getting very competitive very quickly and there's little to differentiate between similarly specified models. The Toshiba CB35 Chromebook 2 with 2GB RAM, 16GB storage and a 1366 x 768 resolution display configuration retails for £189.99 in PC World and Currys too ($262 in the US) – though you do get a slightly faster CPU in the N2840. Apart from our ongoing frustration that the difference between UK and US prices is shockingly apparent at this end of the market, just about any Chromebook can be a bargain. But specs only tell one part of the story.